The EPX05 panel meter provides a versatile display that can increase productivity by offering the plant floor or production area a large visual display of their current status. These EPX05 Series panel meters accept various analog inputs and offer the same features as our highly successful PXP Series Panel Meters. Additional plug-in cards can add alarms, analog output, and communication/bus capabilities, making the EPX05 a truly intelligent panel meter. The EPX05 panel meter is designed to be mounted into a panel or enclosure. By using additional mounting accessories, the EPX05 can be surface-wall mounted, suspended, or bottom mounted. Rear Terminal Block: External switches can be wired via the terminal block. A minimum of 3 switches would be required. Optional Programming Remote: The programming remote contains buttons similar to the PXI and is connected to the display via a 10 foot cable. Optional Serial Programming: With the addition of an RS232 or RS485 plug-in card, set-up software allows configuration from a PC. Four optional plug-in cards provide dual FORM-C relays (5 Amp), quad FORM-A relays (3 Amp) or either sinking or sourcing quad open collector logic outputs. Plug-in cards also facilitate bus communications. These include RS232 and RS485. A linear DC output signal is available as a plug-in card. This card provides either 20mA or 10V signals, and the output can be scaled independent of the input range. The latest addition to the Large Display Series, the Large Serial Slave Display. The Large Serial Slave Display provides a great way to display values in a large, easy to read format. The six digit display is available in two display heights of 2.25" readable to 130` or 4" readable to 180`. This allows the Large Serial Slave Display to be viewed from anywhere on the plant floor. The Large Serial Slave Display accepts serial ASCII data from other meters, controllers, computers, PLCs or other back of panel devices. 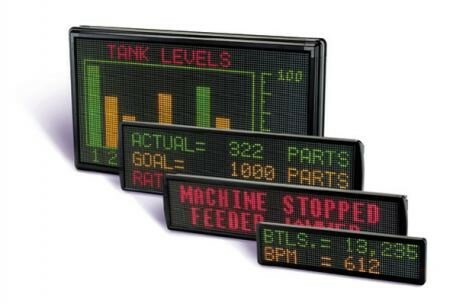 It can also be used as a remote display to show product counts, target numbers, time, cycle timer, production rate, weight, tank levels or other pertinent data. Additional features include complete numeric and extensive alphabetic capability, adjustable display intensity, decimal point transmission with acquired data, and various reset options. The Large Serial Slave Display is packaged in a NEMA 4X enclosure made of lightweight aluminum.